Elmore James’ 1961 recording is a straight ahead blues shuffle, with a horn section providing some counterweight to his slicing guitar lines and half-screamed vocals. A radio repairman by trade, Elmore James was known to have rewired his amplifiers to get a distorted sound, years before distortion became a key element of rock and roll. Apparently no film or video exists of Elmore James performing — it surely would have been exciting to watch. 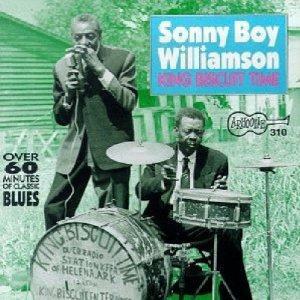 Sonny Boy Williamson was a major radio star in the 1940’s on King Biscuit Time, America’s first live blues radio show. He wrote dozens of songs that became blues standards, notably “Help Me” and “Eyesight to the Blind." He recorded “One Way Out” in 1961, but his 1965 version is better known, and the one included here. There’s a good chance the first time you heard “One Way Out,” it was by The Allman Brothers Band, who recorded it in 1971 and released it in 1972. The live recording has all the elements that made them unique: the relentless beat of two drummers, the intertwining guitars of Dickey Betts and Duane Allman and Gregg Allman’s gruff vocals.